In stock - low quantity. Order in the next 17 hours, 39 minutes and it will go out today! 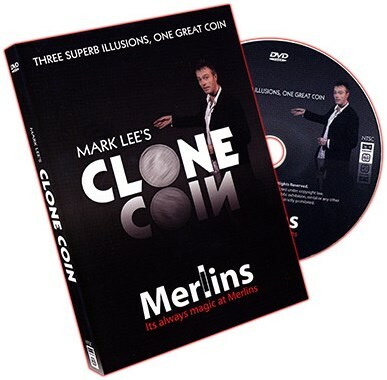 Mark Lee presents three amazing illusions, with his super clean 'Clone Coin', easily explaining the techniques and methods behind his amazing routines. "Once you see the ingenuity of the coin, the possibities are endless." Clone Across, is a simple coins across in your hands effect. You start off by displaying two coins openly, there is obviously nothing else in your hands. You place the two coins, one at a time, and very cleanly, from your right hand to the left. You now pick the two coins up with your right hand, and display them. They are then thrown one at a time into your left hand (you can even hear them clinking), and you grip them, making a fist with both hands. You make a magical gesture, and although your hands never come anywhere near each other, you can now show that you have one coin in each hand! Clone Matrix - Using four coins, which are shown and counted, and two regular playing cards, borrowed if you wish. The coins are spread out in to a square formation. Two of the coins are now covered by the playing cards. When one is lifted, a coin has gone, and when the other card is lifted there are now two coins under it. This is repeated, until all the coins are now under one card! You can now show you have only two cards and four coins! 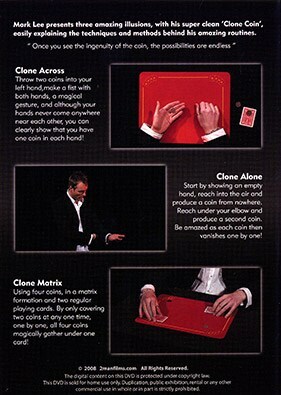 Clone Alone - Start by showing an empty hand, reach into the air and produce a coin from nowhere. Reach under your elbow and produce a second coin. Be amazed as each coin then vanishes one by one! Comes with a professionally shot DVD, using various angles to provide the best teaching experience available, and Euro Coin gimmick. Note: Ungimmicked Euro coins NOT included. "All coin workers will want one of these as a matter of course"